Or view larger version. Untitled. July 1934. Unknown photographer. Gelatin silver print. Collection of Oakland Museum of California. The Oakland Tribune Collection. Gift of Alameda Newspaper Group. This photograph shows two dead men on a sidewalk with several men standing next to them, in San Francisco, California in July 1934. 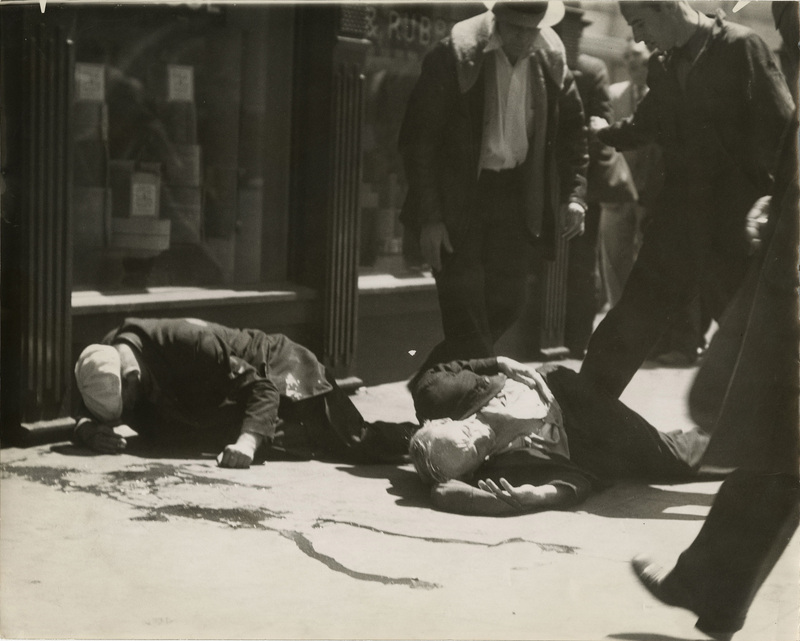 The two men, Howard S. Sperry and Nickolas Bordoise were killed during a waterfront workers strike and their deaths initiated a citywide general strike. The waterfront workers were striking for better wages, shorter work hours, and for the right to unionize.